Once a customer has logged in to their account, their point balance is displayed underneath the default welcome message. You can configure in the administration panel whether this is displayed or not when the customer has a balance of zero. Located in the user's "My Account" section, this is where all point-related information can be accessed in the front end. On this page, five sections are located: Points Summary, Redeem Your Points, Send Points to a Friend, Earnings History, and Spendings History. Following is a brief summary of each. This section summarizes how many points your customers have and also invites them to look at the "Redeem Your Points" section. This section displays a grid of products that your customer is able to spend their points on. If the customer clicks on one of the products they are taken to that product's page where they can add it to their cart and use their points. 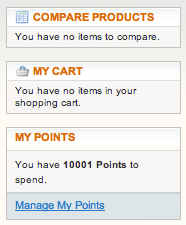 The number of products displayed in the Redeem Your Points section is configurable in the administration panel. 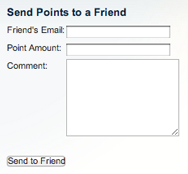 In the Send Points to a Friend Section, your customers with user accounts are able to send points amongst each other. Simply enter in the email of the customer receiving the points, the currency and amount of points you would like to send, and optionally a short comment for your friend, then press the "Send to a Friend" button to give your points to someone else. This is useful for when your customer is a few points short of a redemption and has a friend on your website that is willing to give them a few points to redeem. Or maybe one of your customers has a special day coming up, such as a birthday, that another one of your customers would like to celebrate with a nice gift of points. Regardless of why the points are being given, your customers will be able to be more involved with your rewards campaign. This section displays your customer's complete point earning history. Any points that have been earned in the past are displayed here in detail. The amount, date, status as well as a comment on how the points were earned are displayed here. If the points were earned via an order, a link to that order is provided. Just as the Earnings History section displays a detailed breakdown of how your customer's points are earned, the Spendings History section does the same for how they are spending their points. It too displays the amount, date, status, comment and order link of every point spending action they have taken. This sidebar is displayed when your logged in customer is navigating the store. It is useful to quickly remind your customer on how many points they have accrued, the amount of points they are spending in their shopping cart (if any), and the remaining points they are able to use. This will constantly remind your customers of their points, making them more involved with your loyalty program. When a customer is browsing your store, MageRewards automatically displays point information alongside your product's information. 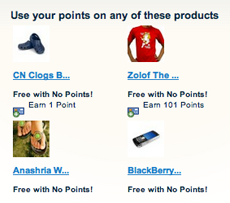 Customers are able to see how many points they can earn on each individual product, if any. Also, the lowest price calculator shows your customer what price they can get the product using their points balance, if the product can have points used on it. Customers will be more likely to be enthusiastic about prices if they see the instant savings they can achieve using your points program. When a customer is viewing a product page, they will see how many points they will earn on purchase of the item they are viewing, as well as a drop down titled "Use Your Points" that shows the customer their point redemption options. If the user chooses a redemption that requires further input, such as the "Point Slider", then that will appear if required. The "My Cart" page displays all the products of the customer's cart in detail and summarizes and totals the transaction. If a coupon code is needs to be entered for a point discount or bonus it can be done here. There are three major differences within the My Cart page when using MageRewards: the Products Table, the Use Your Reward Points section and the Checkout Summary section. The Products table has a few features that are designed to help summarize the point transactions of the cart. There is a "Before Points" column that simply displays the price of the product before any point discounts. 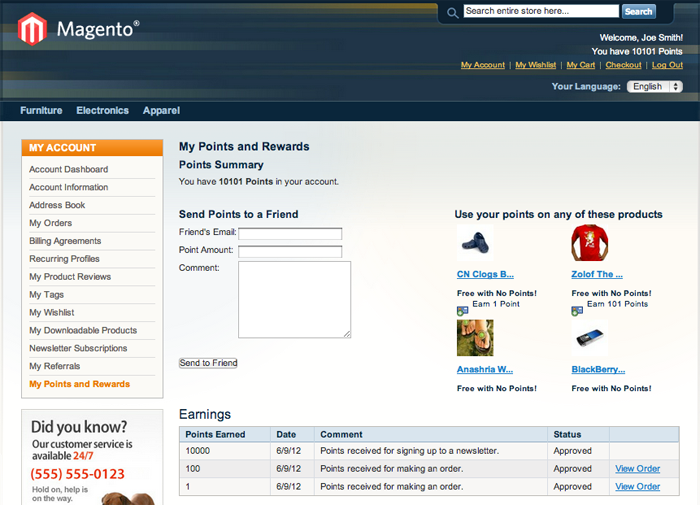 The "Points" column gives the user information on the point changes related to the item, broken down into "Points Earned" and "Points Spent". If there are no points being earned or spent, the related information will not appear. If there are points being earned or spent, the user can click and expand for more information. Please see the screen shots to further illustrate this. The "Subtotal" column displays the subtotal price of the item after point discounts. This section displays the related shopping cart point earnings and possible spendings. These differ from the product (catalogue) earnings and spendings because they are applied to the whole cart rather than just one product in the cart. If the customer chooses to opt for a shopping cart point spending they simply need to click the green button beside the name of the point spending. Along with the subtotal and grand total, the Checkout Summary section displays the points being spent, earned, as well as the total discounts received. The last thing your customers will see before proceeding with their checkout is your point loyalty system. To receive points for voting in a poll, tagging a product, signing up for a customer account, writing a product review, rating a product, sending a product referral email to a friend, or signing up for an email newsletter, simply do so and (if there is a point rule associated with that action) you will be rewarded with points. If you found anything in this manual hard to understand, improperly written, or missing, please comment below. It is made to be a great source of information for you, our customers, and if you feel there are any improvements/additions you can make that will help out others just like you, PLEASE DO SO. Thank you for your interest in MageRewards!